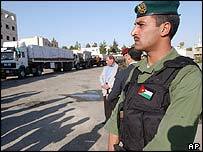 The new interim Iraqi government is considering Jordan's offer to send troops to help stabilise Iraq. But the deputy foreign minister said he expected the government to reject it. Hamid al-Bayati told the BBC that interim Iraqi Prime Minister Iyad Allawi had, instead, written to Egypt, Bahrain and Oman requesting troops. King Abdullah told the BBC's Newsnight programme on Thursday: "If the Iraqis ask us for help directly it will be very difficult for us to say no." 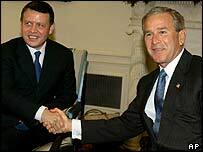 "If they fail, then we will pay the price," King Abdullah said, adding he did not think Jordanian were "the right people" for the job, however. The king is the first Arab leader to consider sending troops to Iraq and the move is likely to please the US. "To have fellow Arabs patrolling I'm sure would be welcome," an unnamed US official told Reuters news agency. The BBC's Dan Damon in Baghdad says while Iraqis would really like far fewer foreign troops in their country, the majority would certainly find Arab forces far easier to accept than the current coalition. Praising the new Iraqi leaders, whom he described as "good, tough, courageous people" King Abdullah urged them to call on the Jordanian people for support. "The challenges... that face them on security are going to be their major problem and they are going to need everybody's help," he said. "My message to the president and prime minister is 'tell us what you want, tell us how we can help and we have 110% support for this," he said. King Abdullah is one of Washington's closest allies in the Arab region. However, the Jordanian people, many of whom are of Palestinian origin, are strongly opposed to Washington's policy in the region, particularly in Iraq and Israel. In his interview, the king warned the US that lack of progress in resolving the Israeli-Palestinian conflict was undermining America's hopes of being seen as a peace-maker in the Middle East. "Because people don't see the movement on the Israeli-Palestinian issue, they look at Iraq and... they're very suspicious and they feel that this is just another extent of occupation." US Under-Secretary of State John Bolton rejected the charge. He said the Israeli-Palestinian conflict was not the root cause of unrest. "I don't think that is the only cause of terrorism. I think that that's a convenient excuse for a lot of the terrorists. I think much of it is aimed against the West in general and the United States in particular," Mr Bolton said. "If we don't stand with them... then we will pay the price"